In their new album "Here Comes Science," the band revisits that song, and follows it with a new track titled "Why Does the Sun Really Shine?" describing the science of plasma. The album also includes an ode to the elements, descriptions of what blood does in the body, and songs describing the scientific process. 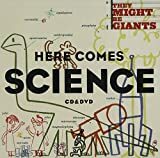 In this segment, John Linell and John Flansburgh of They Might Be Giants join Ira to discuss the album, and to play some science songs. Digital Sampling and Remix Culture: Creativity or Criminality?